Notes: Unlike a number ( OK most) small and/or craft distilleries that have sprung up in recent memory Apple Country Spirits definitely fits the profile of what a Farm Distillery should be. While there are a good number of distilleries now in New York State (over 60 active ones) and many use the New York product rules and exemptions which specify they use over 80% of New York sourced products to make their distillates, there are many fewer that would qualify as true farm distilleries in the truest sense of the word in my mind – using products on their own family held land just outside the doors of the distillery. Apple Country Distilling is part of the fourth generation owned Defisher Fruit Farms in Williamson, New York. Comprising about 750 acres of land, the family farm produces cherries, apricots, peaches, pears, pluats, and raspberries. While many of these fruits are sold wholesale, they decided to start a distillery using their fruit to make distilled products.When asked why he would drop a boatload of money on distilling equipment, tasting room, new building and hiring on a master distiller, He was enthusiastic and had a number of thoughtful answers to this question. First and foremost was that he wanted to be sure they did all we could to keep the family farming operation profitable and viable for the next generation an add on or amplification of this was create a new value added product made from the fruit that they already grow to further the goal of keeping the family farm going and diversify their products. The second part of the answer was a bit more visionary and ambitious “To create a “legacy” for our area of NY. To start a new tradition of Upstate being known as the home of the highest quality fruit distilled spirits in the country “. The product that anyone in the distilling business makes is almost inevitably of course vodka – but at least his first one Tree Vodka , was not a grain vodka using reverse osmosis fear of flavor water to cut it, but a mix of their own apples and water to make a vodka that actually tastes like something with a distinctive smell and taste. It also has the distinction of being gluten-free and as such has a government certified and approved labeling stating it is naturally gluten-free. This their Plum Brandy, made from Heirlom Blue Plums also comes from trees on their property, and the entire process of harvesting, fermentation, distillation, bottling, etc., is done on site. In this case, like their other eau de vies, brandies and applejacks, this brandy is distilled in their 250 gallon Vendome copper pot still and taken off at a lower proof to preserve taste and character.. Other products include a Cherry Brandy, a Pear Brandy, a Peach Infused and Raspberry Infused (not just flavored like far too many) versions of Tree Vodka, a real 100% apple Applejack aged 2 years, an unaged Applejack, and a Overproof Applejack along with their Rootstock Hard Cider series. First Impression: Luscious smell of heirloom blue plums, you can smell the aromas and oils lofting from the glass and tickling your nose.with their aromatic and slightly waxy scents with hints of peach, apricot, and pear.Nicely aromatic and bracing with the alcohol in the background and mixing nicely with the plum scents. Taste: Delicious slightly oily and sweet entry rapidly followed by drying and aromatic vaporization on the tongue with a lingering, medium length finish of plums and a touch of sweetness backed up by the warming of the alcohol. 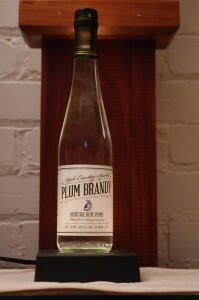 Drinks: This plum brandy makes for an interesting swap out for Maraschino in a Last Word or and Aviation. Also extremely good in a white Sangria or a punch. With a little imagination this eau de vie/brandy can lead to some great new cocktails. Bottle: Clear glass with slightly odd finish to it make it seems just a touch translucent rather than transparent. ½ size (375 ML ) bottle, this is a convenient size for both price and ease of use. Smaller size ensures that you won’t have to worry nearly as much about the eau de vie oxidizing or losing its charm before you use it up, and also avoids making a sizable investment in something that while great, you may not use a lot of at any one time.Simple graphics on a white label with blue plum tinge at edges gives it an older feel and the design and graphics make it subtle yet easy to spot. Synthetic black cork ensures a tight seal to keep everything fresh. Satin finish black foil neck capsule with two thin gold lines at bottom and gold tabbed pill give the bottle a slightly classy touch. Thoughtful and understated design gives the bottle shelf and eye appeal. Label is fairly easy to soak off if you care to reuse the bottle for infusions, oils, etc., after you have emptied it of eau de vie.